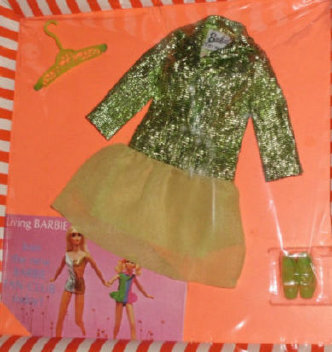 In 1970 Mattel introduced two more Francie dolls; #1129 Growin' Pretty Hair Francie and #1122 Hair Happenin's Francie. In 1971 #1068 Sun Set Malibu Francie was released. 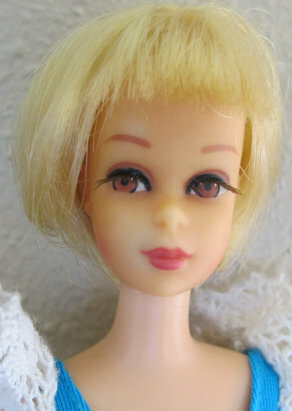 These pretty dolls had brown eyes and blonde hair. They all were packaged wearing a dress or swim-suit, clear X stand, and booklet. Some included other items as well (see below). #1122 Hair Happenin's Francie (1970-1972) In the box she had 4 hair pieces and low soft blue heels. 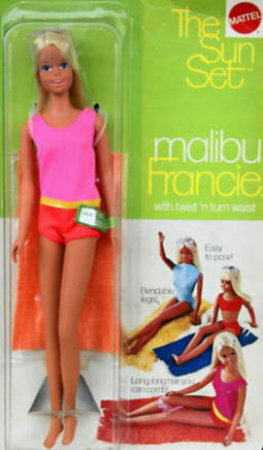 1971 arrived the very popular #1068 Sun Set Malibu Francie with her dark suntan. Marking (1971 and 1972): ©1966/Mattel, Inc./U.S. Patented/ U.S. Pat. Pend./Made in/Japan. The 1973-1976 version of Sun Set Malibu Francie was the same doll but she had a new mark © 1966 Mattel, Inc. U.S. Patented U.S. Pat. Pend. Made in Korea. In 1971 #1074 Growin' Pretty Hair Francie (1971-1973) which is the same doll as #1129 except she had the new stock number #1074. She was made with different arms (like the talking Barbies). She came with two extra hair pieces, and a new updated box. Note: Both versions were available in 1971 and both came wearing the same silver and pink dress with low soft pink heels and both had a clear X stand. Both dolls Marked: ©1966/Mattel, Inc. U.S. Pat. Other Pats. Pend.Pat. Canada. Marked: ©1966/Mattel, Inc./U.S. Patented/ U.S. Pat. Pend./Made in/Japan.